Margaret, Queen of Scotland, eldest daughter of King Henry VII of England by his wife Elizabeth, daughter of King Edward IV, was born at Westminster on the 29th of November 1489. Before she was six years old negotiations were opened, which dragged on for several years, for marrying the princess to James IV of Scotland, whose support of the pretender Perkin Warbeck it was hoped to avert by such an alliance. Eventually the marriage was celebrated in Edinburgh on the 8th of August 1503. The avaricious Henry VII gave his daughter a scanty dowry and quarrels on this head embittered the relations between the two kingdoms, which the marriage, although accompanied by a treaty of perpetual peace, did nothing to heal. 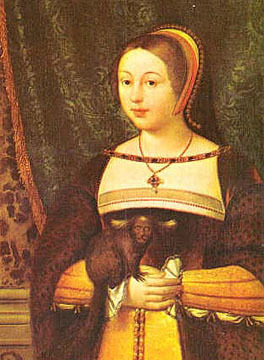 The whole of Margaret's life after her marriage with James IV was an unending series of intrigues, first with one political faction then with another; at one time in favor of her native country, at another in hostility to it, her conduct being mainly influenced at all times by considerations affecting her pocket. Margaret was crowned at Edinburgh in March 1504. Until 1507 she had no children; between that date and 1510 two sons and a daughter were born, all of whom died in infancy; in 1512 she gave birth to a son who succeeded his father as James V; in 1514 she bore a posthumous son, Alexander, created Duke of Ross, who died in the following year. A dispute with her brother King Henry VIII over a legacy claimed by Margaret was a contributory cause of the war which ended at Flodden, where James IV was killed on the 9th of September 1513, having by his will appointed Margaret sole guardian of her infant son, now King James V. Scotland was divided mainly into two parties, one in favor of alliance with England, and the other with France. The leader of the latter was John Stewart, Duke of Albany, next heir to the crown of Scotland after Margaret's sons; Margaret herself for the most part inclined to the English faction; and when Albany returned to Scotland from France on the invitation of the Scottish parliament in the spring of 1514, the conflict grew almost to civil war. Various projects for Margaret's remarriage had already been started, Louis XII of France and the emperor Maximilian being proposed as suitable husbands for the young widow, when the queen privately married Archibald Douglas, Earl of Angus, on the 6th of August 1514. The consequences of this marriage were to alienate many of the most powerful of the nobility, especially the earls of Arran and Home, and to make Margaret entirely dependent on the house of Douglas; while it furnished the council with a pretext for removing her from the regency and guardianship of the king in favor of Albany in July 1515. Albany had to blockade Margaret in Stirling Castle before she would surrender her sons. After being obliged to capitulate. Margaret returned to Edinburgh, and being no longer responsible for the custody of the king she fled to England in September, where a month later she bore to Angus a daughter, Margaret, who afterwards became Countess of Lennox, mother of Lord Darnley and grandmother of King James I of England. In the summer of 1516 Margaret went to her brother's court in London, while Angus, much to his wife's displeasure, returned to Scotland, where he made his peace with Albany and was restored to his estates. The rivalry between the French and English factions in Scotland was complicated by private feuds of the Hamiltons and Douglases, the respective heads of which houses, Arran and Angus, were contending for the supreme power in the absence of Albany in France, where at the instance of Henry VIII he was detained by Francis I. Margaret, quarreling with her husband over money matters, sided at first with Arran and began to agitate for a divorce from Angus. In this she was probably aided by Albany, who had been in Rome, and who found an unexpected ally in the queen-mother, Margaret being temporarily alienated from the English party by her brother Henry's opposition to her divorce. When Albany returned to Scotland in 1521 his association with Margaret gave rise to the accusation that it was with the intention of marrying her himself that he favored her divorce from Angus, and it was even suggested that she was Albany's mistress. As Albany was strongly supported by the Scottish parliament, Angus found it necessary to withdraw to France until 1524. During these years there was constant warfare between the English and the Scots on the border, but in May 1524 Albany was obliged to retire to France. Henry VIII continually aimed at securing the person of his nephew, the king of Scots; while Margaret veered from faction to faction without any settled policy, unless it were the "erection" of her son, i.e. his proclamation as a reigning sovereign, which she successfully brought about in July 1524. The queen-mother had at this time fallen in love with Henry Stewart, second son of Lord Avondale, whom she married immediately after obtaining her divorce from Angus in 1527. Margaret and her new husband, who was created Lord Methven, now became for a time the ruling influence in the counsels of James V. But when her desire to arrange a meeting between James and Henry VIII in 1534 was frustrated by the opposition of the clergy and the council, Margaret in her disappointment revealed certain secrets to Henry which led to her being accused by her son of betraying him for money and of acting as an English spy. In 1537 she was anxious to obtain a divorce from Methven, and her desire was on the point of being realized when it was defeated by the intervention of James. Two years later she was reconciled to her husband, by whom she had no children; and, continuing to the end to intrigue both in Scotland and England, she died at Methven Castle on the 18th of October.